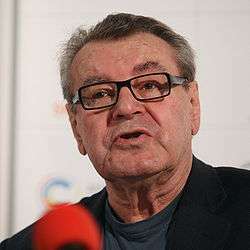 Jan Tomáš Forman (Czech: [ˈjan ˈtomaːʃ ˈforman]; born 18 February 1932), known as Miloš Forman ([ˈmɪloʃ ˈforman]), is a Czech film director, screenwriter, actor, and professor, who until 1968 lived and worked primarily in Czechoslovakia. Actress Hana Brejchová was Forman's 18-year-old former sister-in-law at the time she was given her first film role in his international success Loves of a Blonde, which earned her 3rd place in the Best Actress category at the Venice Film Festival. Forman was born in Čáslav, Czechoslovakia (present-day Czech Republic), the son of Anna (née Švábová), who ran a summer hotel. When young, he believed his biological father to be Rudolf Forman, a professor. Both Anna and Rudolf Forman were Protestants. During the Nazi occupation, a member of the anti-Nazi Underground named Rudolf Forman as a member of the Underground while being interrogated by the Gestapo. Rudolf was arrested for distributing banned books and died in the Mittelbau-Dora concentration camp in 1944. Forman's mother died in Auschwitz in 1943. Forman has stated that he did not fully understand what had happened to them until he saw footage of the concentration camps when he was 16. He is professor emeritus of film at Columbia University. Along with future favorite cinematographer Miroslav Ondříček and longtime schoolfriend Ivan Passer, Forman filmed the silent documentary Semafor about Semafor theater. Forman's first important production was the documentary Audition whose subject was competing singers. He directed several Czech comedies in Czechoslovakia. However, during the Prague Spring and the ensuing 1968 invasion, he was in Paris negotiating the production of his first American film. His employer, a Czech studio, fired him, claiming that he had been out of the country illegally. He moved to New York, where he later became a professor of film at Columbia University and co-chair (with his former teacher František Daniel) of Columbia's film department. One of his protégés was future director James Mangold, whom Forman had advised about scriptwriting. In the mid 1980s, Forman frequented parlor gatherings with Claudia and Arthur Mokarow, two confidantes of world chess champion, Bobby Fischer. Fischer, Forman, and actor Peter Falk would gather at the Mokarow estate in Pasadena, California. During one discussion, Forman learned about the publication Fischer authored, I Was Tortured in the Pasadena Jailhouse, which was a ranting recount of his time spent in the Pasadena Jailhouse. Fisher had been arrested for vagrancy while wandering the streets of Pasadena with no visible means of support. Forman was told by Claudia Mokarow that a script was being written about the incident. Forman was infatuated by the concept and discussions evolved to make the film, with Forman serving as its director and co-producing with the Mokarows. As the project developed, Fischer discovered that Forman was Jewish and that the scriptwriter, John Schulte, was Catholic. Fischer terminated the project immediately. In 1985 Forman headed the Cannes film festival and in 2000 did the same for the Venice festival. He presided over a ceremony of Caesar in 1988. In April 2007 the jazz opera Dobře placená procházka premiered at the Prague National Theatre, directed by Forman's son, Petr Forman. Forman received an honorary degree in 2009 from Emerson College in Boston, USA. Loves of a Blonde is one of the best–known movies of Czechoslovak New Wave and has won awards at the Venice and Locarno film festivals. It was also nominated for the Academy Award for Best Foreign Language Film in 1967. A 1967 Czechoslovak-Italian co-production, this was Forman's first color film. It is one of the best–known movies of Czechoslovak New Wave. On the face of it a naturalistic representation of an ill-fated social event in a provincial town, the film has been seen by both movie scholars and the then-authorities in Czechoslovakia as a biting satire on East European Communism, which resulted in it being banned for many years in Forman's home country. The first movie Forman made in the United States, Taking Off won the Grand Prix at the 1971 Cannes Film Festival. The film starred Lynn Carlin and Buck Henry, and also featured Linnea Heacock as Jeannie. In spite of initial difficulties, he started directing in the United States, and achieved success in 1975 with the adaptation of Ken Kesey's novel One Flew Over the Cuckoo's Nest starring Jack Nicholson and Louise Fletcher. The film won Oscars in the five most important categories: Best Director, Best Actor, Best Actress, Best Picture and Best Adapted Screenplay, one of only three films in history to do so, along with It Happened One Night and The Silence of the Lambs, and firmly established Forman's reputation. The success of One Flew Over the Cuckoo's Nest allowed Forman to direct the long-planned film Hair (a rock musical) in 1979, based on the Broadway musical by James Rado, Gerome Ragni, and Galt MacDermot. The film starred Treat Williams, John Savage and Beverly D'Angelo. Forman's next important achievement was the adaption of Peter Shaffer's Amadeus in 1984—retelling the story of Wolfgang Amadeus Mozart and Antonio Salieri. The internationally acclaimed film starred Tom Hulce, Elizabeth Berridge and F. Murray Abraham. The movie won eight Oscars, including Best Picture, Best Director and Best Actor (Abraham). His adaptation of Pierre Choderlos de Laclos's novel Les Liaisons dangereuses, it had its premiere on November 17, 1989. Another film adaptation by Stephen Frears had been released the previous year and received much acclaim. The film starred Colin Firth, Meg Tilly and Annette Bening. The 1996 biographical film of pornographic publisher Larry Flynt brought Forman another Oscar nomination. The film starred Woody Harrelson, Courtney Love and Edward Norton. The biography of famous actor and avant-garde comic Andy Kaufman (Jim Carrey, who won a Golden Globe for his performance) premiered on December 22, 1999. The film also starred Danny DeVito, Courtney Love and Paul Giamatti. This free biography of Spanish painter Francisco Goya (American-Spanish co-production) premiered on November 8, 2006. The film starred Natalie Portman, Javier Bardem, Stellan Skarsgård and Randy Quaid. Forman's early films are popular among Czechs. Many situations and phrases from his movies have passed into common use. For example, the Czech term zhasnout (to switch lights off) from The Fireman's Ball, associated with petty theft in the film, has been used to describe the large-scale asset stripping that occurred in the country during the 1990s. 1 2 List of Milos Forman nominations. Awardsdatabase.oscars.org (January 29, 2010). Retrieved on June 23, 2011. ↑ "Hana Brejchová". Česko-Slovenská filmová databáze. POMO Media Group. Retrieved 1 November 2014. ↑ Milos Forman Biography (1932–). Filmreference.com. Retrieved on June 23, 2011. 1 2 Wakeman, John. World Film Directors, Volume 2. H. W. Wilson Company. 1988. 349–356. 1 2 Tugend, Tom. (July 19, 2007) Milos Forman directs Natalie Portman in ‘Goya’s Ghosts’—film melds art tour and history | Arts. Jewish Journal. Retrieved on June 23, 2011. ↑ Turnaround Review – Milos Forman – Salem on Literature. Enotes.com. Retrieved on June 23, 2011. ↑ I Had a Wild Life. The Guardian. Retrieved on June 23, 2011. ↑ Milos Forman page at Columbia University. Directory.columbia.edu. Retrieved on June 23, 2011. ↑ "News Articles in 2009". Emerson College. ↑ "The 39th Academy Awards (1967) Nominees and Winners". oscars.org. Retrieved November 9, 2011. ↑ "The 41st Academy Awards (1969) Nominees and Winners". oscars.org. Retrieved November 15, 2011.